Hello fellow sewing friends! I am Elizabeth from I Sew, You Sew and I am so excited to share my first project as an official Fabricista! I love reading about all of the Fabricistas and their makes so it's great to be included in this mix of wonderful sewists. For my project I felt a bit ambitious and wanted to make a three-piece outfit that would be great for holiday shopping and gatherings- comfortable, but pulled together. This ensemble will get a lot of wear in the coming days! So let's get to the sewing details! I looovvvveeee a quilted jacket and often find myself pinning them on Pinterest, see here, here and here. These are just a few of my favorites. I think I could spend all winter making jackets like these and still want to make more. So when I saw that Grainline Studios had released a quilted jacket pattern I had to make it up. This jacket has been a labor of love- I spent a good bit of time hemming and hawing over the decision to hand quilt the jacket. I was unsure about my ability to complete the hand quilting in an efficient manor but really knew that I would love the hand stitching once completed, so I went for it! I am so glad I did, it really infused the jacket with a unique touch that no machine can duplicate. I drew inspiration for the hand quilting from Saskiko embroidery techniques. This tutorial from Radiant Home Studio is a good place to start for a quick lesson on this technique. For my purposes I chose to use what supplies I already had on hand rather than order specific supplies, so I ended up using a 2 1/2 inch embroidery needle and DMC pearl cotton size 8 thread in black and off white. I chalked my lines 3 1/2 inches apart and then 1/4 inch apart. I used a Clover Chaco liner and love this little gadget. The lines go on easily but aren't permanent and dust off pretty easily so I had to reapply the lines from time to time as I went. Although this part of the project was time consuming, sometimes it's just nice to take a break from machine stitching everything and spend a few evening hours hand stitching. 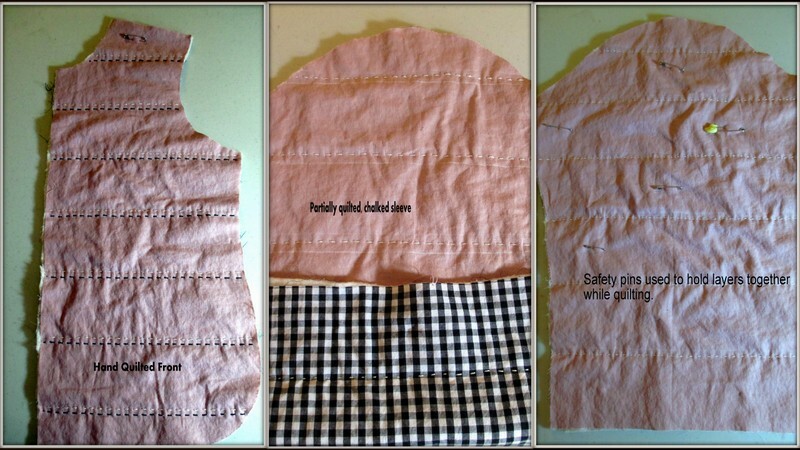 The fabric is a beautiful dusty blush linen, Fabric Mart linen fabrics can be found here. It has a nice hand and worked perfectly for this project. For the lining I used a black and white cotton gingham from my stash and the batting is cotton quilt batting. I must say that a walking foot is essential to this project for construction purposes. This jacket would've been a mess without the walking foot since there are so many layers to join. After joining the seams with my walking foot I finished the seams with my serger. If you are new to quilting, as I am, I have minimal experience with it, you might want to check out this post on the Grainline site. The pattern came together easily and the welt pockets were a first for me. I consulted a few online tutorials on welt pockets but the included instructions were very good and I ended up following them exclusively. My pockets aren't perfect but for my first go round with welts, I'm happy (plus can I just say how nerve wracking it is to slash fabric you just spent HOURS hand quilting!). I may try making the inside finishing cleaner next time. I used the recommended coat hooks for closures but I think some beautiful frog closures would be great too or even toggles- that may be my next version! As far as fit goes, I think this may be a bit roomy but as the pattern describes it is made to wear a sweater underneath, so its a layering jacket and I like that idea. I sewed a straight up size 6 even though my measurements would have put me at a 4 for bust, 6 for waist and 8 for hips. Next time I will try grading to a 4 in the shoulders since I have slightly narrow shoulders. Over all I have to say I love this jacket and its extremely comfortable, cozy and soft- like wearing a quilt of course! I have already worn it out several times and received compliments. I know another is in my future and I may have to hand quilt it as well since I am partial to that look. Although Fabric Mart doesn't carry the Tamarack jacket pattern other Grainline patterns can be found here on the Fabric Mart site. A great tunic is a must for me and this is a great Tracy Reese pattern for McCalls. I used view A in a lovely Fabric Mart cheetah print challis, find challis here. This challis has such a soft hand, I love the drape of it as well. I thought it would pair beautifully with this pattern. Sometimes challis can be a bit of a challenge since it is such a soft somewhat slippery fabric. I have found that if I am careful to handle it gently and using lots of stay stitching I have less problems with stretching out the fabric while sewing. If you are nervous you can even use Sullivan's fabric stabilizer. Its pricey but well worth your money if you are worried about slippery fabrics. I love the details on this pattern, the pintucks- they are in the front and back, the shaped, split hemline (of which I added an inch to the front for a little more coverage), gathers at the sleeve head and the mandarin collar. I made a size 10 as per my bust measurement and like the fit. I serged all raw edges and the pattern came together fairly well, again if you staystitch rounded areas (like neckline) before construction you will save yourself a lot of headaches of fitting neckline and collar together- I had a smidge of trouble with that area but nothing a little tweaking couldn't fix. I omitted the called for snap in the neckline and just stitched it down, there's still a lot of room to get my head in and out. The fit in the bust area is just right, some room but not so much that I am swimming in it. Overall, a pattern that I'd love to make again. After seeing Tiffany's version of these ponte pants I really wanted to try them out. They are adorable on her- and I love those center front pintucks! But I am still learning about a great fit with pants and honestly I needed to add about a 1/2 inch wedge in the backside. I found a tip online that suggested to add a wedge to the top, center back of the pants, I eeked out about an extra 1/4 inch in the back and that helped the fit tremendously. I have always had a problem with pants dipping down in the small of my back, so it seems natural that I'd need some extra length back there- always learning about fit! Also, I took about 1/4 inch off the front rise. The pattern has you insert an invisible zipper but honestly the stretch of my ponte made that zipper a moot point- these are a size 14, but my thinking is that if a pattern company would make a pant with a size 14 backside and size 12 front side that would be my perfect fit!! Also I left off the included back pockets, they looked ridiculous when I tested them out- totally disproportionate to my- ummm, rear. These pants turned out closer to leggings for me and will go great with longer tunics. I love the ponte knit from Fabric Mart since it is thicker than legging fabric and will keep me warm this winter. The color is a soft black and the stretch has great recovery. I am excited to wear this ensemble out for holiday shopping and gatherings, but I am equally excited to mix and match all of these separates into my existing wardrobe. As of this past year I have really tried to make pieces that will mix and match with an occasional accent piece thrown in for fun. I love the idea of a capsule collection and want to lean toward that, but sometimes you just have to sew with the fabric that calls to you, am I right?! Lovely and slightly unusually pairing of these three items. I like them together! Your workmanship is excellent especially since you are new to quilting. Thank you! It was fun to do something outside of my norm for a change! Thank you so much Levone! This jacket is a great blank slate so I say- go for it! I also have quite a few things to sew through in the next few weeks- hope it will all be ready by Christmas! Great outfit! I particularly love the jacket--the sashiko quilting really "makes" it! Thank you so much Michelle! There's just something about embroidery/sashiko that I love! I am going to try to copy you pattern for pattern and fabric for fabric. OK?? The jacket is wonderful. I'm thinking how warm it must be. Great job. Great!! Copy away I take that as a HUGE compliment! Thank you for your kind words. It is a warm jacket, but the southern climate I'm in means that I have a pretty light winter. The pattern mentioned using wool batting which I think would probably "up" the warm factor. Great pieces! I'm sure that you will get lots of use out of them, as they are all so versatile! I was planning on making that McCalls pattern for my daughter, so thanks for the tips about the staystitching. Thank you Ann, the top is great. I have really enjoyed wearing it, and the little details really make it for me. wonderful Tamarack! My tamarack is blogged over at Allie J. I "played it safe' when I made mine...I do wear it all the time but I think you nailed it with the hand quilting and the pale pink fabric! So cute! I will have to make another in January. Thank you for your kind words! Your Tamarack looks like such a versatile piece- I'm sure you will get tons of wear from it. I'm loving the options to personalize this pattern and like you, I really want to make another, because everyone needs more than one quilted jacket right!? Absolutely awesome! I love the entire look, you did a great job!